Lovable Vicky has two main aliases for parties; Patches and Mary Liquid the Fairy. Both are hilarious silly comedy party characters and are very much larger-than-life. 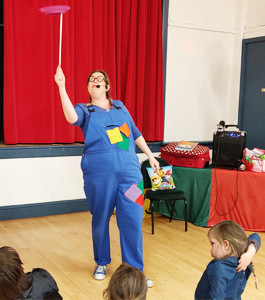 Vicky uses a slick combination of magic, circus skills and clowning to entertain children of all ages, and there's always loads of audience participation in Vicky's mighty magic show. 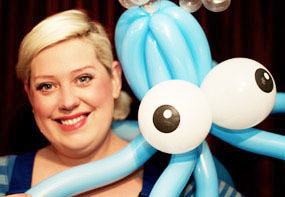 She'll make balloon animals for the children to take home, plus there's performer-led dancing, interactive games, a mini disco, and her bubble machine makes loads of lovely poppable bubbles. Vicky can host themed parties too. Vicky truly loves her job and both children and adults leave her parties with a big smile and aching sides. Vicky now also provides circus workshops. Brilliant! "Dear Susannah, Vicky was a great hit with the children - she arrived promptly, knew exactly what would keep the children interested and did a thoroughly brilliant routine. All the children enjoyed it and many parents commented how good she was keeping a large group of children entertained and interested for the full hour and a half. She certainly made the party and please convey my thanks to her. Kind Regards, Hilary"
"Vicky is still being talked about by the adults as well as the children. She has such a presence with children and is so genuine too. 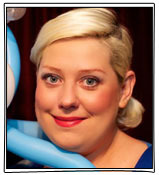 I haven’t met a children’s entertainer like her …. she engages so well with the children and got some of the grown-ups involved too (yes, the kids loved this). 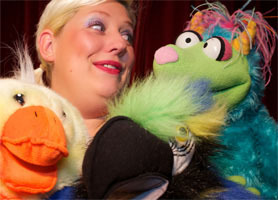 Vicky is great fun and captured our children’s attention right from the start. Many thanks, Donna." "Patches was a great hit with the children and my son is still saying ‘naughty Patches’ when someone does something wrong. She arrived promptly, knew exactly what would keep the children interested and did a thoroughly good routine. All the children enjoyed it and many parents commented how good she was keeping a large group of children entertained and interested for the full hour and a half. Kind regards, Hilary"